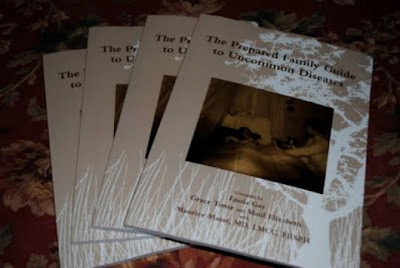 I'm pleased to announce the birth of our neighbor Enola Gay's totally awesome book, The Prepared Family Guide to Uncommon Diseases. I've watched Enola work on this book for months. It is the most extraordinary blend of sound medical knowledge and laymen's information. The idea behind this book is to have a handy guide to diseases that are (cough) "eradicated." These are diseases we seldom have to deal with in our modern sanitary high-tech society, such as typhus, malaria, cholera, influenza, even starvation. Really nasty stuff, right? But what happens in a grid-down situation when modern medical treatment may not be available? What do you do if someone in your family comes down with the symptoms of one of these threats? You read Enola's book, that's what. In simple laymen's terms, she walks you through a brief outline and history of each disease, as well as signs, symptoms, treatments, and containment. In addition to exhaustive research on each disease, she had the information reviewed in detail by a doctor with experience in many of these diseases to verify its accuracy. The book is laid out in an easy-to-follow format. Toward the end of the book are recipes for rehydration fluids, baby formula, etc., as well as treatments for many of the side effects of the diseases such as ear ache, sore throat, etc. As if that isn't enough, she also includes a shopping list which will insure you're well-stocked and well-prepared to handle a worst-case scenario. In short, I believe this is a book EVERY prepper should have, no exception. "In a TEOTWAWKI, grid-down or terrorist attack scenario, we maybe faced with a resurgence of potentially deadly plagues and diseases. With few resources and limited access to medical equipment, facilities and knowledge, we may very well be thrust into the roll of caretaker and medical practitioner for our families, friends and neighbors." In my own survival guide, I give natural remedies for common ailments, but not many of the things listed here. Already, with our porous southern border, there have been reports of outbreaks of leprosy in the SW United States. As the number of infected people come in unchecked, there will be a higher risk of diseases we have never had to deal with before. I applaud her efforts. There is certainly a need for a book of this sort. This looks awesome! Definitely right up my alley. I just found your blog through True Femininity and wanted to say hello, from another Idahoan who, from the looks of it, has VERY similar beliefs and views! :) Love your blog so far!! Excited to share your WND article with my MIL (if she didn't read it already, she loves WND!) who is a 32 year homeschooling mom!! We are very much in agreement with you. As soon as I saw they were ready to order, I picked one up. I'm an RN, although not currently practicing. Our hospitals just aren't set up for the kind of epidemics that occurred in the past. In the case of "eradicated" diseases, I'd rather care for my family at home as much and as long as possible (with phone guidance from our MD). Hospitals and doctor's offices will become contagion points instead of places to get better. Thanks, Joyfilled! Welcome. I'm glad to meet you. if you haven't already shoot a link to this book over to survivalblog. maybe those readers (of which i am one) will do a book bomb on that to. as you said this is a book that is needed for survival from the supposedly irradicated diseases if a grid down or other major disaster overwhelms or cuts off access to medical facilities. This one has some medical advice, so maybe best to not put this one up on your comment page. I travel for my job in the oil business. shots for pretty much everything. the same vaccinations up to date that are needed for travel to primitive countries can't hurt. Here's what our onboard medic (ex British army) had to say when I asked him about this very subject of a list of vaccinations for my family to make sure they're covered for pretty much anything.